HomeWebsite Development & Web DesignRue Lafayette Inc.
Brooklyn-based Rue Lafayette specializes in importing kosher gourmet products from France and distributing them to the U.S. market. The products include gluten free pasta, crackers, gourmet mushrooms, organic teas, organic chocolate and more. The New York web design by Bitochon is an Ecommerce site that enables customers to browse, shop and purchase items using credit cards.The owner can also update prices , product details,update images,quantities, website content, and view orders. The website also comes with an easy-to-use administration interface so that revisions can be made to content as needed. 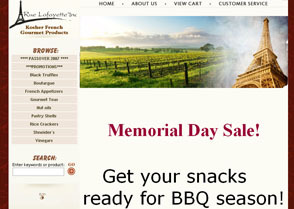 For example, Rue Lafayette can easily change the products displayed on the site and also can post specials.